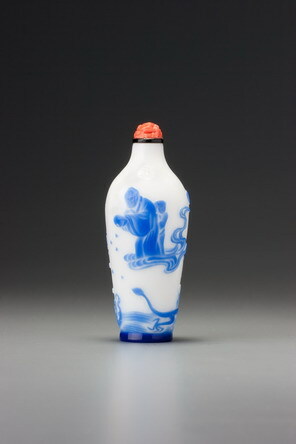 The calligraphic style here resembles that of Zhou Honglai so closely we feel safe in attributing it firmly to his hand. His strokes are modulated as if written with a brush, and his style is both distinctive and impressive. It is possible to get some degree of modulation by pressing harder with the jagged point of a diamond tool, as is evident from the works of other calligraphers in this medium, but Zhou, among a small group of others, went much further. He added further incisions where he wanted to thicken a stroke or produce an oblique flourish, so vital to elegant calligraphy in the esteemed style of Wang Xizhi. Under high magnification, it is obvious that in some cases he has made a number of incisions to achieve his calligraphic elegance. This may seem like a severe restriction to calligraphic flow, and in the hands of a lesser artist, it might prove so. The uninitiated often tend to think that elegant calligraphy depends upon a continuous flow of the uninterrupted brush, impossible if one has to go back and add a bit here and there. This may be true of certain styles of extremely cursive script, but is certainly not true of all scripts. Many a calligrapher will work the tip of the brush back and forth across a stroke, particularly noticeable on a larger scale, until exactly the right shape is achieved, and the same is true of Zhou Honglai’s miniature calligraphy. In this mode, the continuous energy is at a different level to a simple, flowing brush that never retraces its step. Ledao zhuren is one sobriquet of an extremely important figure in nineteenth-century history, Yixin (1833 – 1898). He merits three-and-a-half pages in Hummel’s Eminent Chinese of the Ch’ing Period (pp. 380 – 384), for while the Xianfeng emperor (his half-brother) fled the capital in the face of wrathful allied European troops in 1860, Yixin was faced with the task of dealing with the invasion that led to the destruction of the Yuanming yuan. In the aftermath, it was he who signed the Treaty of Tientsin, and it was he who ceded to Russia all territory east of the Ussuri River; but it was also he who founded the Tsungli yamen (Zongli yamen) and served as its head for twenty-seven years, trying to steer the weakened empire through the treacherous waters of international relations in the late nineteenth century. 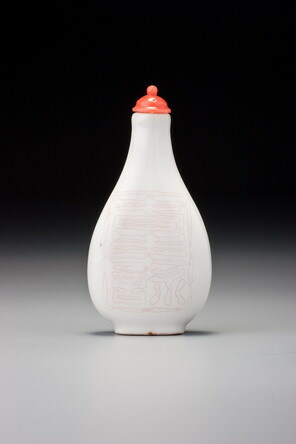 The red colouring here is unusual; black is the standard for this range of wares, and many of Zhou’s works are without any coloured filling at all. The ten odes, written by the Ledao zhuren himself (according to the inscription), are given here in their Treasury 6 translations. We add only that each poem begins with ‘If you want to know where spring is born’, and ends with a reduplicative, such as congcong (‘flourishing’; poem 1) or youyou (‘far-reaching’, ‘aimlessly’; poem 10). Tang dynasty examples of poems starting with ‘If you want to know where spring is born’ are examination poems, poems expected to conform to certain formal standards and to contain ample praise for the fine state of things under the current emperor. We have been able to check one of Yixin’s two poetry collections; we did not find these poems, but our sense is that this poem is very much in his style. The banners lit up in the radiance hardly flutter. Once set in motion, the positive element manifests itself ceaselessly. Its benevolence touching all things. [The present] reign sanctioned by Heaven is flourishing. A strong sense of auspiciousness fills every corner. The heavenly power benefits all living things. Beautiful colours are reflected on a thousand doors. Lovely scenery can be enjoyed at all times. The sunny suburbs vibrant with lush trees and plants. The breezes are balmy; the sun emits a cosy warmth. Sparse willows lining a green embankment. Moreover, many poems are inspired. [Even] the [swimming] fish listen to tunes played by string instruments. Among a riot of blooms birds chirp in chorus. The green grass grows in great luxuriance. Pleasant scents lure [one’s] attention. The peach and plum trees strive to provide a canopy. Lovely smells pervade the walking paths. Fresh breeze caresses [one’s] bosom. As various shades of green veiled in mists look more and more sombre. A traveller resting in a garden dreams of being urged [to move on]. [He] leans on the balustrade to take in a splendid view. By allowing timely rain to come. As dusk falls, birds fly up and down. The net of Heaven is loosely knitted, but still all-embracing. [When] sunlight starts to shine and the scenery looks fresh. Poetic moods are aroused as the surroundings change. Everywhere the city is shaded in the colour of the willow. Flowers emerge above the hedges, taking them as their lodgings. Streams that flow by reflect people’s faces. Their scales shimmer as they dart about chasing one another. Knowing the divine power of the creative force in the universe. Light cast on the rippling water bounces on the railing of the winding walkway. Languorous flowers look like they are hugging a screen. My poetic soul indulges in reveries. The scented grass [too] appears greener each day. [When] last year’s swallows return in the new year. [They] rather circle round and round their old nest [to check out its condition]. This feeble pair just glide with the wind. This path strewn with orchids is shrouded in drifting haze. When the flowers in the forest burst in riot and their fragrances disperse. In good times this must be the same [everywhere]. Viewing such scenes is enough [to make one] happy to go out. The bookshelves are full of books and scrolls. and poems placed in] a satchel. The lazy clouds [in the sky drift by, looking] light as wisps of cotton. As the moon, dim and faint, begin to emerge in the early evening. When sunlight is warm and the air is saturated with a feeling of auspiciousness. Ordinary flowers shed a few petals near some dwellings. Wild apricots grow in profusion near a mountain inn. Only a purified heart can appreciate this [wonderful] vision. The green pond also shows traces of a passing breeze. [I] could not help leaning on a railing, letting my thoughts drift aimlessly.